Last month we (Heather, Kim, Laura and Aisha) signed a contract with Bloomsbury Publishing for a book entitled ‘Celebrity, Aspiration and Contemporary Youth: Education and Inequality in an Era of Austerity’ based on the CelebYouth study. We’re currently writing the first chapters with the final manuscript due in February 2017. We’re very excited about this book and the interest we’ve had in our work meant we felt optimistic about finding a publisher. However securing a deal for the book we wanted to write turned out to be trickier than we thought. I describe that process in this post. As Michael Billig’s classic study of how ordinary people talk about the Royal Family demonstrated, The Royals present an interesting ‘academic puzzle’. Yet, in recent years relatively little academic attention has been paid to the cultural and political significance of the Windsor family. As scholars working across both Sociology and Cultural Studies, Laura Clancy and Kim are both interested in how the Royal Family are mediated, particularly against a backdrop of austerity, ever-growing inequality and declining social mobility. As they show in this blog, academic research into inequality would be greatly enhanced by a critical examination of the Royals. Elsewhere we have examined how the Royals’ position of immense wealth and privilege is justified and legitimated, arguing that constructions of ordinariness and authenticity are pivotal in erasing structural inequalities and enhancing public perception of the Royals. In this blog post we will further examine these processes by considering a recently aired television documentary, When Ant and Dec Met the Prince: 40 Years of the Prince’s Trust. This month the BBC’s children’s channel CBBC launches the 10-part series Pocket Money Pitch. This Dragons’ Den style show invites young entrepreneurs (aged between 8 and 14) to pitch their plan for the chance to win a year’s worth of ‘pocket money’ investment in their fledgling businesses. BBC business presenter Steph McGovern fronts the show dedicated to finding the ‘business brains of the future’. McGovern declared ‘Hopefully this will kick off the careers of our future business leaders, and we’ll find the next Richard Branson or Martha Lane Fox’. In each episode participants undertake set challenges including fighting a ‘head-to-head pitch battle’ to win a mentor to help them to the next stage. The show’s business ‘gurus’ include fashion designer Myleene Klass, Hussein Lalani (founder of 99p Stores), Rob Law who invented the Trunki suitcase, spicy sauce creator Levi Roots and Sarah Jane Thomson, founder of children’s national newspaper First News. In this guest blog, Anita Biressi, Professor of Media and Society at the University of Roehampton, looks at what the show and the reading list of one of its mentors reveal about the complexities of growing up today. On the 26th November we were lucky enough to join forces with In Defence of Youth Work for a workshop exploring young people, celebrity and entrepreneurialism. We are really excited to announce that we have a new event which you can now register for! 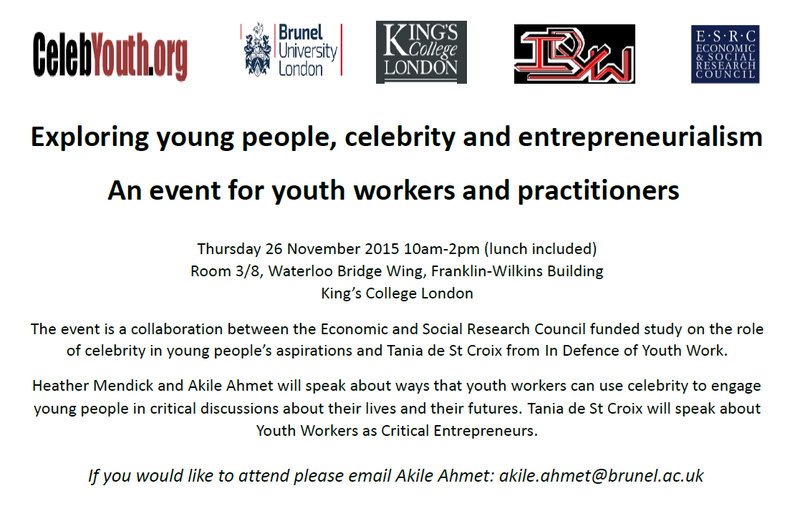 The event is a half day workshop in colloboration with In Defence of Youth Work and Kings College London entitled: ‘Exploring young people, celebrity and entrepreneurialism: an event for youth workers and practitioners’ on 26 November 2015 10am-2pm (lunch included) at Kings College, University of London. The event will explore the findings and resources from the CelebYouth project as well as exploring the work of In Defence of Youth Work and Tania de St Croix. The relationship between young people and the media is always a complex one. On the one hand, their experiences as part of the audience are often extremely positive, with their media tastes and pleasures playing a big part in the whole construction of their own identity; on the other hand, they are often quite worried about the ways in which media might have a negative impact upon other young people (especially those younger than themselves). This ambiguity is further complicated by the ways in which they find themselves represented by the media- often demonised (‘hoodies, louts, scum’) or pathologised as victims (young girls and body image, the radicalization agenda). Talk of aspiration has been running through social policy in the United Kingdom and beyond for decades. Labour and Conservative politicians see it as a way to address inequality and to get working-class people to become more socially mobile. Prime Minister David Cameron called the UK an ‘aspiration nation’ and opposition leadership candidate Andy Burnham opened his campaign with his intention to make Labour ‘the party of aspiration’. In such pronouncements, aspiration remains alarmingly vague. In this guest post, Garth Stahl explores how we can use the theoretical tools of French sociologist Pierre Bourdieu to study the identity negotiations surrounding aspiration, and particularly the aspirations of working-class young men and their sense of value. 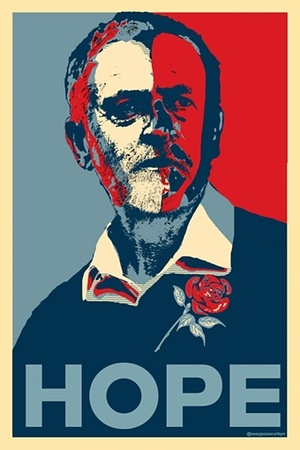 At CelebYouth, we’re excited about Jeremy Corbyn’s rapid rise to position of runaway front runner in the UK Labour Party Leadership election. Our research on youth aspirations has documented the impact of austerity on young people’s lives and Corbyn offers the promise of a mainstream challenge to that. However, we’ve also been interested in the transformation of Jeremy into a celebrity and the fandom that’s circulating about him. In this post Heather highlights some examples of this and discusses why it matters.